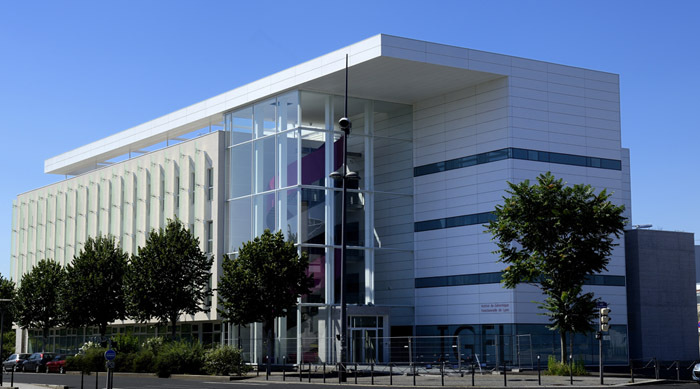 The Institute of Functional Genomics, Lyon, is one of the ENS de Lyon’s research departments. The building’s 4500 sq. m. comprise office space, laboratories, separate clean rooms (classified L2), temperature controlled facilities, etc. The building houses 14 full sized research labs, 2 junior team labs and 2 bioinformatics dry-labs on four floors including the ground level. The site is located opposite the Halle Tony Garnier, in Lyon Gerland’s new biotechnology district, near the Confluence of the Rhône and Saone rivers. The building is implanted upstream of where this main avenue splits providing it with a highly visible position in the urban landscape. The site’s configuration has helped determine the building’s shape: it’s ‘head’ is located at one extremity of the site, the main body of the building runs parallel to the avenue, and the building’s entrance hall is nested within their junction. The building will showcase French research in functional genomics. The double helix staircase located in the building’s glass paned entrance hall spans up to the top floor. As the building’s figurehead, it’s a strong symbol of the research activity undertaken in the laboratory, and promotes the IGFL as a hotspot in this domain. -To strategically position adequately dimensioned technical facilities in a volume located fours levels above the ground floor. Due to visibility from the surrounding area and avenue, a pergola and custom-built shelter were designed to address the visual aspects of this dominant feature. 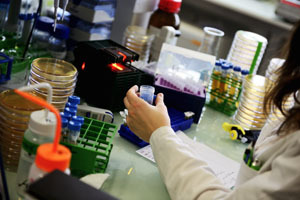 -To allow for adaptability and evolution of the laboratories in view of the highly dynamic nature of the activities. The research platforms / laboratories are completely independent of essential features such as stairs, elevators and technical lifts. -To provide a functional solution with regards to the different streams of personnel and materials through the building. The white rooms are grouped together in the head of the building with associated accesses and airlocks. -To ensure a comfortable and visually pleasing working environment with efficiently regulated acoustics and temperature.